Summer is just around the corner, and this is a time when families and friends are making plans for having some outdoor fun. 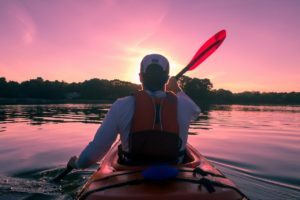 You will see many friends and families have barbeques, and they will be visiting their local theme parks, they will be having a great time in parks, walking through trails- and one popular summer activity is kayaking! Kayaking is a fun activity for families and for groups of friends. However, if you don’t properly plan for that kind of outing and you don’t take the precautions needed, it can become a disastrous situation- one that can easily be avoided. The first thing you must do before even consider going on your kayaking outing is to get a life jacket or a personal floatation device (PFD). You want to make sure that you go somewhere where you will find the best PFDs for kayaking. In fact, if you don’t have a life jacket while going anywhere that involves traveling by water, that is illegal! So, get your life jacket before you do anything else! You will also need to get a helmet too. The next thing to pay attention to is the weather conditions as well as the water temperature. Even if the weather is perfectly fine while you go on your excursion, you need to prepare yourself for the possibility that the weather will change. If the water is extremely cold, be sure to wear a dry suit that will keep you comfortable and warm. Also, don’t forget to eat and drink plenty of water to stay energetic and hydrated. This will take a lot out of you! You will also need to wear high-quality sunscreen that has SPF of 30 or higher, regardless of the weather. You need to be protected from the UVA and UVB rays that the sun emits, especially if you are going to be kayaking between the hours of 11 am to 3 pm which the rays are at its strongest. Whenever you go traveling by water, you never must drink or do any drugs whether they are prescription or not, before going. Just like it is illegal and dangerous to drink and drive, the same applies to boating and kayaking. You will also want to make sure that you are aware of any off-shore winds that could potentially make it difficult to go back. Another important safety rule is to never exceed the weight capacity of the boat and always check the quality of the equipment before paddling. If the equipment is worn down, then it cannot be safely used. In fact, if you know very little about kayaking, you will want to look for a qualified instructor that will teach you how to paddle, teach you first-aid as well as water safety. A qualified instructor will help you learn what to do during emergencies as well. Never paddle in a surf zone or in rivers as they can be dangerous. It is your responsibility to find out where you can kayak safely. And last but not least, you need to tell those who you know about your plans, just in case an emergency were to happen so they can seek out help for you. Once you have all of that down, and you go to the source that carries the best PFDs for kayaking, enjoy your outing!